Virtual Reality to Measure, Track and Train the Athletic Brain. PROTECTS AND TRAINS THE ATHLETIC BRAIN. Our clients believe the mind is the ultimate X-factor and has not been effectively measured or trained. Until now. We are the dead lifts and squats for the brain. We help coaches maximize their athlete's unique neurocognitive abilities to read, react and adapt for in-game performance. NFL Combines and physical metrics do not provide the complete picture. This is why Tom Brady was drafted #199. The athletic brain separates average athletes from champions. Injury limits your athlete from practice and training and slows their vision and cognitive skills. Cognitive training allows your athlete to maintain their mental edge. 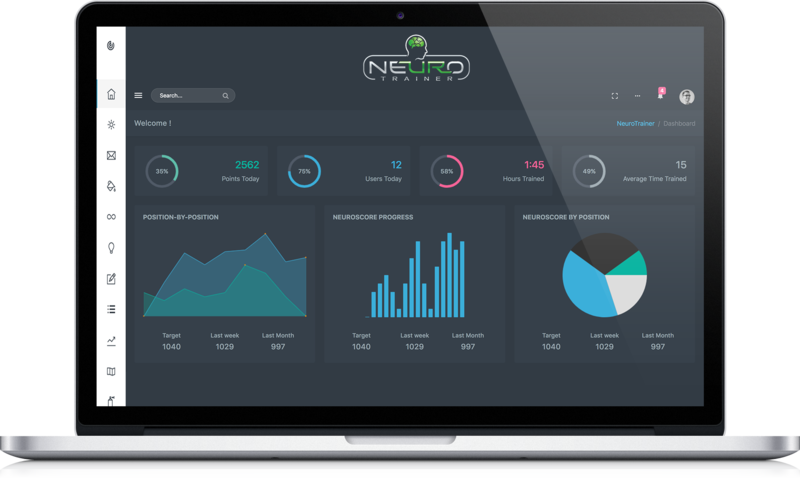 NeuroTrainer is a VR tracking and training suite optimized for baseball, football, hockey, basketball and soccer. It's not enough to track data. Athletics need in-game results. Track "read-adapt-react" performance compared to real-time performance. Train players in key situations that translate to real-game results. Neurotrainer is created by a group of clinicians and neuroscientists with 90+ published research articles on cognitive training, vision and healthy aging. Our exercise software guides the brain's ability to grow. Our research has demonstrated improved vision, enhanced athletic performance and has even helped seniors retain their faculties. Enter your information and we will contact you shortly to set up a virtual demo. If you are an organization interested in learning more about how NeuroTrainer can improve your program's athletic performance, request a demo and we will set up a meeting. Individual results may vary. Claims are not evaluated by the FDA.